Tone your calves by doing calf raises. If bouncing up and down on the balls of your feet doesn't seem like an exciting or efficient exercise, think again. Every time you perform a calf raise your lower legs are lifting your entire body weight. Grab a dumbbell or two, or perform the exercise on a machine, and now you're talking about some real resistance. So, yes, calf raises will strengthen a few muscles very nicely. You have a few choices of how to do your calf raises, but the basic motion is the same. Stand straight on the floor and hold a nearby object, if necessary, to help maintain your balance. Flex your feet to raise your heels as high as possible and then lower yourself under control to the starting position. For greater range of motion, position the balls of your feet on the front edge of a calf block or a similar raised platform, leaving your heels in the air. As you descend, drop your heels below the level of the block. Either way, keep your knees as straight as possible to maintain the emphasis on your calves. Flex your knees to let your quads do some of the work. Add weight to your calf raises to build even stronger calves. Use the basic bodyweight calf raise form but hold a pair of dumbbells in your hands. Do the calf raises while seated by resting a barbell across your thighs, just above your knees. You can also use a variety of calf raise machines. Seated machines include a resistance platform that rests on your thighs. Standing machines have a pair of resistance bars that rest on your shoulders. In general, standing calf raises target the gastrocnemius, your largest calf muscle. Seated calf raises emphasize the soleus, the smaller muscle that lies beneath the gastrocnemius. But you can shift the emphasis a bit by changing your starting position. For both standing and seated calf raises, you typically begin with your toes pointed forward and your feet about hip-width apart. If you point your toes outward or spread your feet wide, you'll target the inner part of each calf. Point your toes inward or keep your feet next to each other to emphasize the outer calves. Warm up before you work your calves with five to 10 minutes of light cardio exercise, like walking. If your time is limited, perform compound exercises that strengthen your calves while targeting other muscle groups. Step-ups, which target your quads, are particularly good for your calves. You can also try squats, lunges and leg presses. If you do leg presses, try a set of calf presses with just the balls of your feet on the bottom of the leg press machine's resistance plate. Which Exercise Machine Tones Thighs? 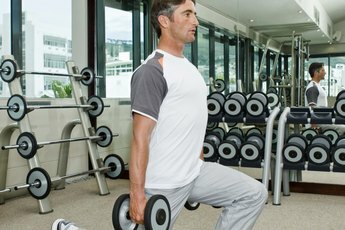 How Much Weight Is Good for Reverse Leg Curls? 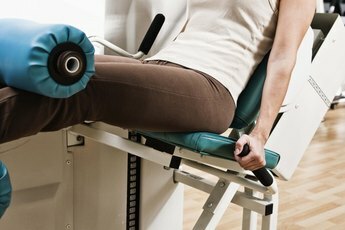 What Gym Equipment Is Good for Inner Thigh Leg Strength?